Recall in Part 1 of this two-part article we discussed formulas for Customer Value, Customer Satisfaction, People Value, and Financial Value. (Click here for Part 1). In Part 2 we will present the notion of Robust Business Strategy (RBS) and how it can synthesize Customer Value and Satisfaction, People Value and Financial Value in the mid to long term to grow the market value of the firm. Don’t worry I am not going to present a whole new approach to business or competitive strategy in this article. We have way too much of that going on in the field. 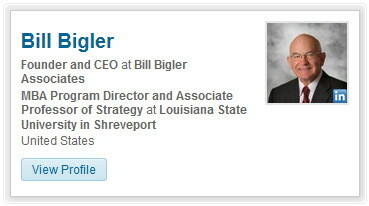 RBS is achieved by forming a “Team of Three” with an executive from marketing, human resources, and finance. 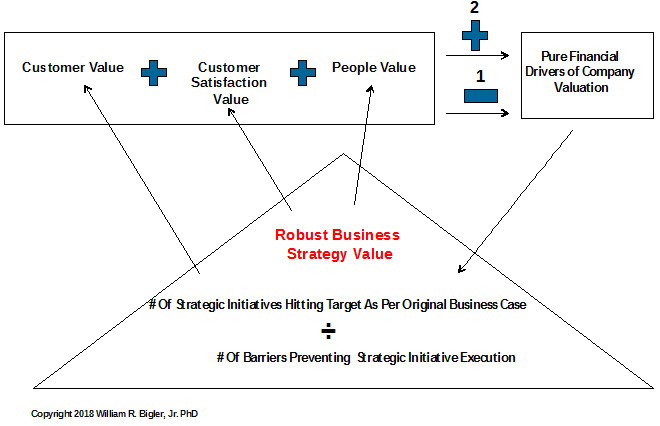 They schedule monthly meetings to monitor and take action on the interactions among Customers, People and Financial outcomes using the formulas in Part 1 of this article series and supplemented with the “formula” for RBS in Part 2 here in Figure 4. For our purposes here, Robust is defined as “strong and healthy, vigorous”. Notice the RBS formula focuses on the outcomes of a good strategy development process. 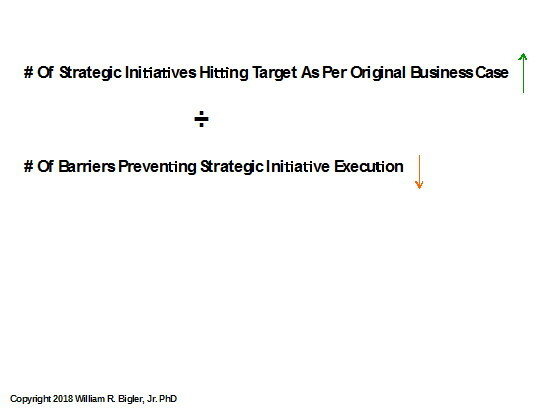 The number of strategic initiatives hitting their targets as per the original business case for each initiative is the numerator. The number and kinds of barriers preventing strategic initiative execution is the denominator. I define a strategic initiative as a project large enough to directly affect the market value of the firm, either up or down. A new product developed, a recent acquisition or quality initiative are all examples of strategic initiatives. The definition of the numerator is very important. For a strategic initiative to be counted in the numerator it must have accomplished its purpose in the time frame set out in the initial Business Case to do the initiative in the first place. Strategic initiatives that do not accomplish their purpose are clear to everyone that they have underperformed. But if an initiative has slipped past its expected completion date as set out in the original Business Case, it is not counted in the numerator either. This holds even if an external customer (or an internal customer if a strategic initiative is aimed at them) has OK’d the slipped date. “Wow”, you the reader probably just thought, “This is a very severe approach”. Answer: yes it is and it is the only way RBS can have any teeth and value to a firm. In the short-term, investing in more value for Customers, investing for more Customer Satisfaction and investing in more People Value are almost always injurious to increases in Financial Value. Why? Firms bear more expenses and allocate more working and fixed capital investment trying to add more value for Customers and People. But over the mid to long-term, if synthesized and aligned properly, firms create an almost unstoppable force in optimizing all three of the values – Customer, People, Financial. My favorite example is Amazon. Wow, do they seem to be an unstoppable force? 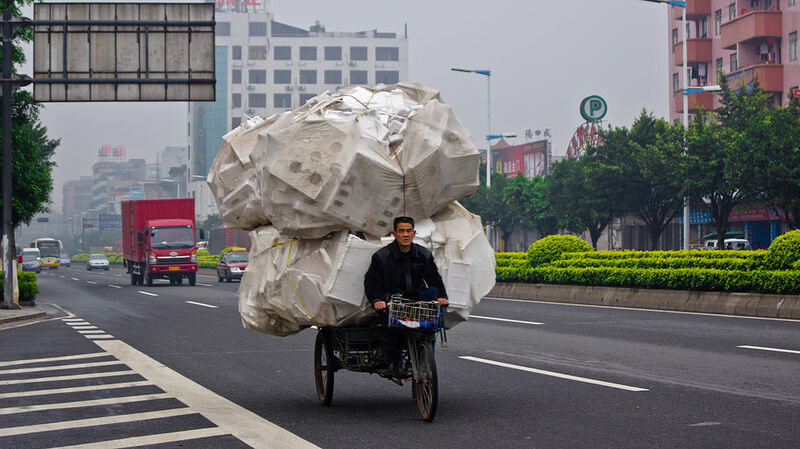 They do not use my phrase RBS, but they work it like a fine-tuned engine. Ensure that the Business Cases for strategic initiative approval are not overinflated with promises of huge outcomes completed in impossible record time frames. Monitor the strategy execution process to identify and remove the four kinds of barriers discussed in a prior article. (Click here for the Four Kinds of Barriers article). If the Team of Three does its job well, then strategic initiatives that are approved hit their targets at expected completion times to increase Customer Value and Satisfaction and People Value (the arrows pointing up from the RBS triangle). As we have said above, in the short term this will usually cause Financial Value to decrease (#1 the large negative sign in the chart). This sends the dotted Feedback loop back to the RBS Team of Three. This should confirm the information they have expected to receive. The resolve here is to not succumb to pressure from security analysts (if the firm is publicly traded) via the CEO to “fix things quickly”. The team has the resolve that in the mid to long run, these investments in Customers and People will pay off as per the original business cases for the approved initiatives. This is depicted by the large plus sign in Figure 5, #2. Now, what happens if things go wrong or even terribly wrong? Usually, the firm has first done something that causes Customer Value and Satisfaction to fall. 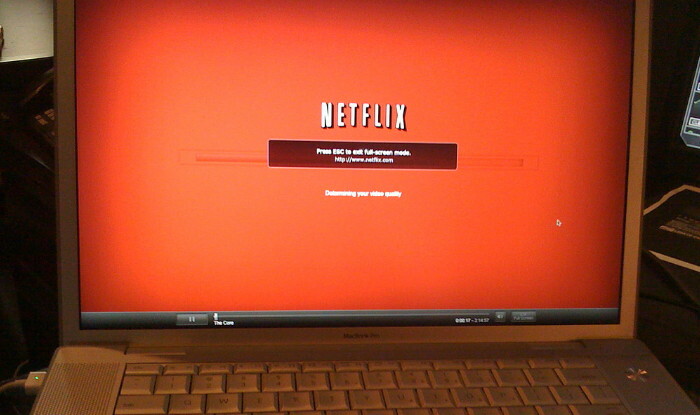 Think of Netflix when it first decided it would charge separately for its shipped DVDs and its new streaming service. Customers can either outright defect or become unwilling to pay the price points needed to drive profits and cash flow. Thus begins a downward spiral and can affect Financial Value negatively but in unexpected ways. Employees can become dismayed. They witness expense reductions, perhaps lay-offs and the seeds of declining psychological wellbeing start to form. Employees perceive they might not be able to achieve their personal goals. Their productivity begins to wane. The very best ones shop their resumes to other firms. These dynamics impact negatively almost all of the pure financial drivers of valuation in Figure 1 of Part 1 of this article series. RBS is the thinking and energy that stops this downward spiral. The Team of Three conducts some form of “root cause” analyses and sends out communications to all stakeholders of corrective action. The Business Case format is re-examined, the strategy execution process is assessed and even blunders are identified and “owned up to”. This starts the next cycle of investments to “right the ship” and over the mid to long-term Financial Value is increased and optimized again. This is a never-ending cycle and dynamic in optimizing Financial Value. The CEO selects an executive from Marketing, Human Resources, and Finance and sets out a charter for this team to manage and lead Customer, People, and Financial Value optimization via RBS. Let’s face it, putting people from Marketing, HR, and Finance together is creating a “strange bedfellow” team. These executives attend meetings of the whole top management team but then usually go back to their shops for most of their work. This team though could set up monthly meetings to assess and manage the various formulas presented in this two-part series of articles. I know this might seem Pollyannaish to some, but it can work. The meetings can become a part of the overall strategic planning process if your firm has such a process. If not, they can be stand-alone meetings. There are many tools out there to help this Team of Three. Customers can be monitored via the American Customer Satisfaction Index (which includes Customer Value questions) and People can be monitored through an annual Employee Satisfaction Survey. My favorite is the Hay Group’s Employee Survey, but others exist or you can develop your own. 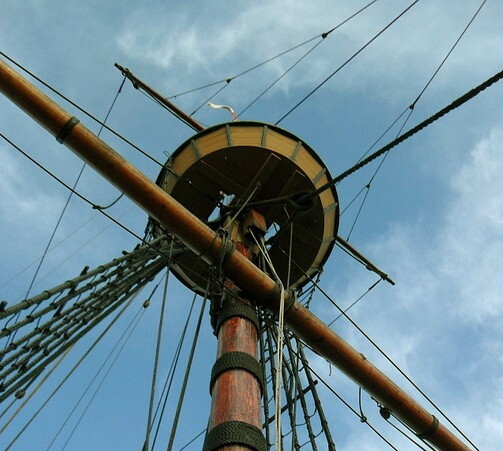 This article series has presented my “crow’s nest architecture” for leading and managing Customer, People, and Financial Value so as to maximize the mid to long-run growth in the market value of the firm. You can develop your own. This is not easy work, but the thinking behind it can become clearer with the astute attention to working the formulas and monitoring what the formulas are telling you.